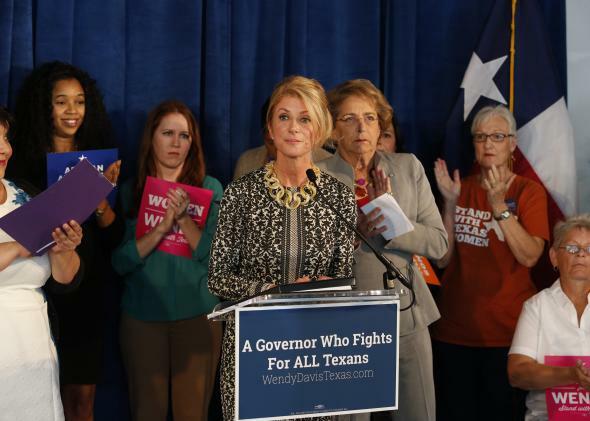 Wendy Davis: The Texas gubernatorial candidate won't defeat Greg Abbott, but she can still win, sort of. Texas gubernatorial candidate Wendy Davis speaks on Oct. 16, 2014, in Houston. I hope this isn’t a sad surprise for anyone, but Wendy Davis is going to lose. There has yet to be a single poll showing the Texas Democratic state senator–turned–gubernatorial candidate leading over the Republican nominee, Attorney General Greg Abbott. Real Clear Politics shows Abbott with an average lead of 15.5 percentage points. Davis is done. But that doesn’t necessarily mean that her gubernatorial adventurism is all for naught. Back in the summer of 2013, when Davis’ star was brightest, Republican strategists told me that if she lost by less than 10 points, that would be significant. “If it gets to a margin of 8 percentage points, then Republicans have a great deal to be nervous about,” said one Texas GOP-er back then who didn’t want to be named. That’s because, for Texas Republicans, winning isn’t enough; they need to win big. If statewide margins of victory shrink down to single digits, then national Democratic donors will think harder about investing serious money in the Lone Star State. That would mean Democrats’ statewide candidates will have an easier time raising funds for 2018 and 2020. Last summer, Republicans were stressed about this possibility. Right now, those worries look unfounded; the most recent poll of the race, from CBS/New York Times/YouGov, gives Abbott an eye-popping 20-point lead. As a point of comparison, Gov. Rick Perry was re-elected in the 2010 Tea Party wave year by 12.2 points. So in one of the best years in modern history for the GOP, an incumbent Texas governor won by a smaller margin than Abbott may be winning by right now. If Davis loses by more than 15 points, then this cycle will have been an unmitigated catastrophe for Texas Democrats. But she won’t lose by 15. (“It’s difficult to lose by that much. You have to try,” said Austin Republican consultant Tyler Norris.) If Davis loses by fewer than 9 or 10 points, then it’s a respectable night for Democrats.